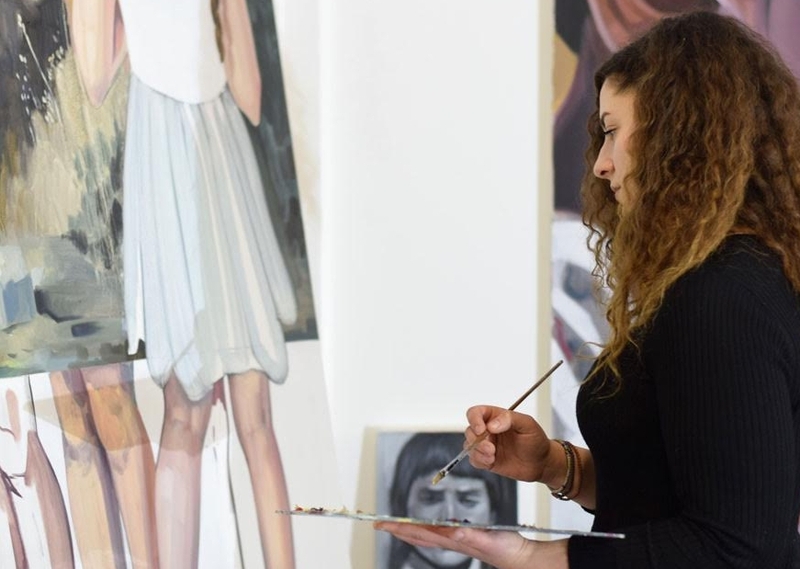 A figurative painter originally from Cyprus, now based in London, Mary Savva graduated from the Slade School of Fine Art in 2016. KM: I really loved your work when I came across it a couple of years ago because of the way you master expressions in your portraits. What are you trying to capture in your subjects? MS: I think what I am trying to get is a sense of isolation, nostalgia for a situation or a place, maybe a melancholic atmosphere. KM: What drew you to portraiture in particular? MS: Portraiture has always been the main subject in my work since I was a child. I had always been certain that this is what I wanted to do so I drew and painted portraits for years. It is so rewarding to start with a line on a piece of paper and end up with someone’s image right in front of my eyes - it was and still is almost magical. During a recent visit back home, I realised how the visual intake I had from the environment that I lived in is the main reason that drew me to portraiture. The houses back home are cluttered with photographs of family members and iconography on the walls, tables and on every piece of furniture there is a picture of someone staring back at you. Entering a Greek orthodox church you confront a similar curation of images. Hundreds of faces of saints are carefully depicted on every wall around the church in bright flat colours. Byzantine iconography was an important, if not the only, experience and access I had confronting paintings in the flesh. I believe it determined my aesthetic and the way I used composition in my own work. KM: Your paintings are typically very large, which as an emerging artist, are not always easy to sell. Do you enjoy the process of painting on large canvases or do you do it more for the final impact of the work? for me. Especially in terms of process, it really helps me deal with the painting in a different way. I also feel that I need to have a one to one relationship at least when I am painting a figure. KM: You have referenced ancient Greek sculptures in your recent works. Do you think you will ever try a different medium, such as sculpture? I have experimented with other mediums before, and from time to time I do make some things out of wax. They are almost like a break for my brain from painting. I do find ancient Greek sculptures incredibly interesting and exciting at the moment. However, I think I am more interested in how they can translate into painting and how I can combine them with other imagery. They also relate to me now not only visually but also symbolically. KM: You have said before that you like to complete a painting in a day and with as few brush strokes as possible. Why is this important for you? MS: I like the idea of an image that first appears to be somehow realistic to have been made with an economy of brush marks. It’s almost like a game where you need to stop at the right moment. For some paintings it works, for others it doesn’t. In most of my work I like to paint some areas in detail and others in economy to create different focal points in the final image. KM: What would you say makes an artist successful? MS: First, I believe a successful artist is not necessarily a good artist. Artists can be successful for various reasons, not always because of the quality of their work. That would probably lead to the question of what makes a good artist, which is another difficult question. I guess for me a successful artist is one who achieves what they set out to achieve, who keeps making work regardless of their circumstances without compromising it or changing it for the market, gallery or curator. KM: Is there anything you are currently working to achieve in your own work? MS: There is a lot of imagery I have gathered over the past few years that I would like to combine together and make paintings from. At the moment I am in the process of trying to figure out how and what would be the best way to combine these images in painting. There are a lot of changes and new possibilities in my practice right now. I think my work is now the most open that it has ever been and can lead anywhere and that is very exciting for me.